Some time ago, I was browsing my Baltimore neighborhood’s Nextdoor forum and came across a link someone shared to a web map of Baltimore’s Tree Inventory. This was of interest to me not only because I love trees, maps and data, but also because I have joined my neighbors in planting a number of trees throughout our community. 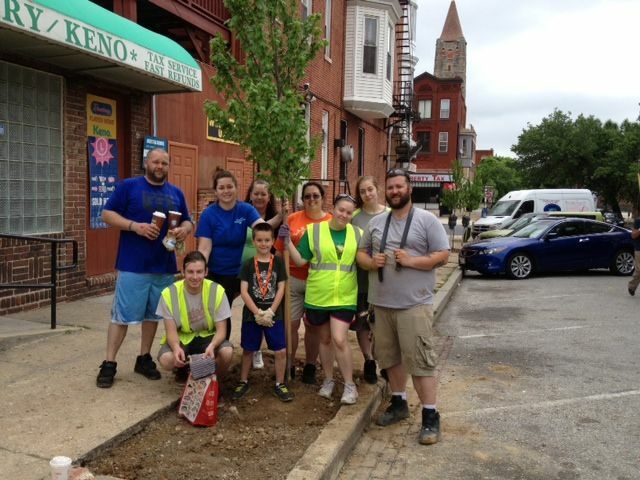 Planting a new tree with members of the community on 23rd street, after “making room” in the sidewalk’s concrete. Digging into the web map, there is a lot of data represented here! Map layers include trees, stumps, as well as locations suitable and not suitable for future planting. Each of the tree features contains a number of attributes including species, common name, height, DBH (diameter at breast height), and much more. All of this data has been painstakingly collected in the field for the entirety of Baltimore, which is no menial task. Built as an ArcGIS Online Web App, the map has useful tools/widgets for interacting with the data, my favorite being the “Infographic” which charts the species breakdown in the current map extent. There are other standard but useful widgets as well, including the ability to change the basemap, take measurements, and toggle layers, just to name a few. 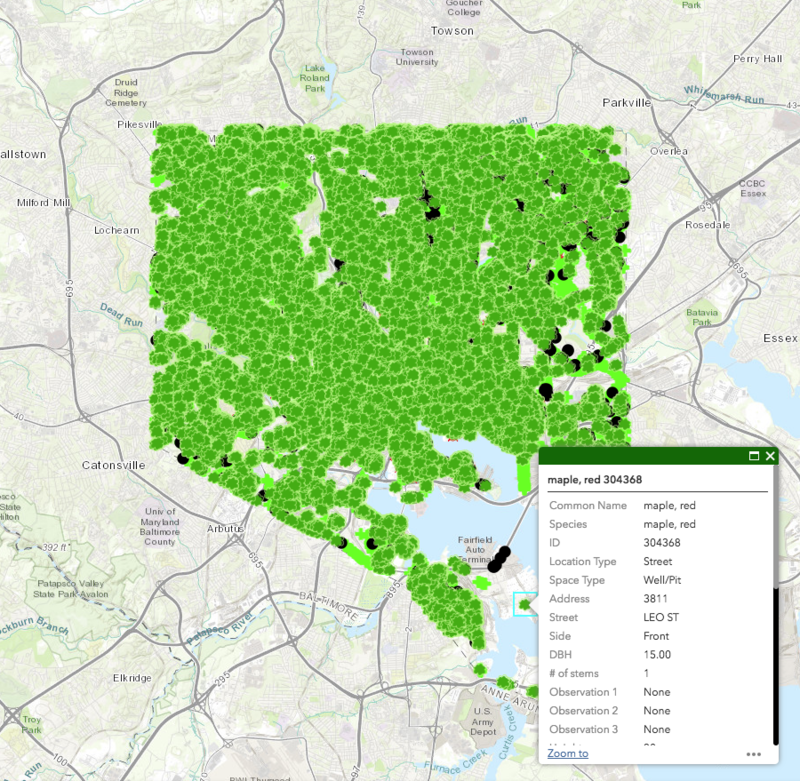 The Baltimore Tree Inventory map is an amazing resource for visualizing tree data and especially to explore the attributes within. After spending some time with the map and data, I had a couple thoughts. First, that the web map performance and rendering is on the slow side dealing with the sheer size and number of points in these map layers. And additionally, that it’s a little hard to get a sense of the density and distribution of these trees with the map’s current symbology. The map seems to be more effective at larger scales (zoomed in to neighborhood/street level) than at smaller scales (visualizing trees across the entire city or spanning multiple neighborhoods) for interacting with the data. This gave me the idea to visualize these points in a different way – as a heatmap. 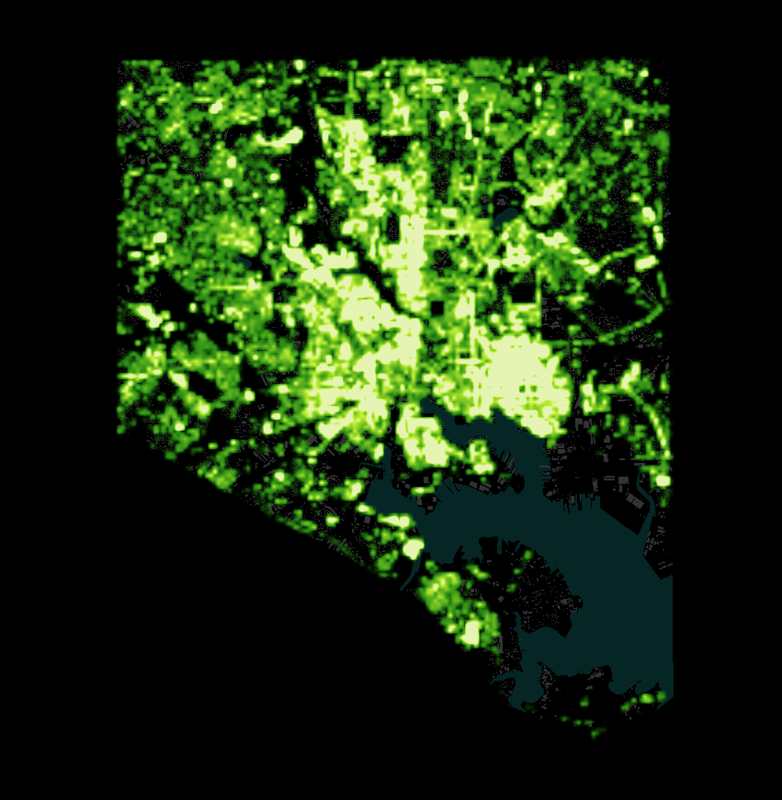 The Baltimore Tree Inventory data in heatmap form. Click the image to explore. The final line above uses tile-join (bundled with Tippecanoe) to merge the tilesets into a single mbtiles file, which I uploaded to our Mapbox account to handle the hosting and serving of vector tiles. The total size of the tiles (created for zooms 10 through 17) is about 30 mb. With more time spent fiddling with Tippecanoe’s many options, I might have decreased the size of the tileset while keeping it usable for my map, but I was happy with the appearance of these tiles across zoom levels. An oblique view of the map, looking Northeast over Druid Hill Park. Finally, I began some coding in the Mapbox GL JS API. After pulling my tileset and setting up the basics, I was finding the trickiest thing to get right was the colors for the heatmap data. I started with a color gradient which showed red for the densest data, as is so commonly seen in heatmaps. But this just felt wrong. We’re dealing with trees here, so the color palette should reflect a greener theme. I consulted with Tim, our graphic designer and 3d specialist, whose design decisions I would trust with my life. We toyed with a lot of ideas before landing on the fairly simple range of greens seen in the current interactive. In a heatmap, the key to getting the color right seems to be thinking in how intensities should be represented. In the case of this heatmap, I started wrongfully thinking I wanted areas with more trees to be greener, but the reality is I simply want those areas to pop. So denser areas take on a lighter, near-yellow green which really grabs a users attention, while less dense areas take on the a base green color. Above zoom 17, it is no longer effective to keep the “heat” in the map. I switched to symbolizing the trees as circles, and included a popup on hover which provides the tree species. Above zoom 17, trees are represented by circles, and include some interaction. Viewed in heatmap form, the data tells a somewhat different story than what we see in the Baltimore Tree Inventory map where trees are individually symbolized. 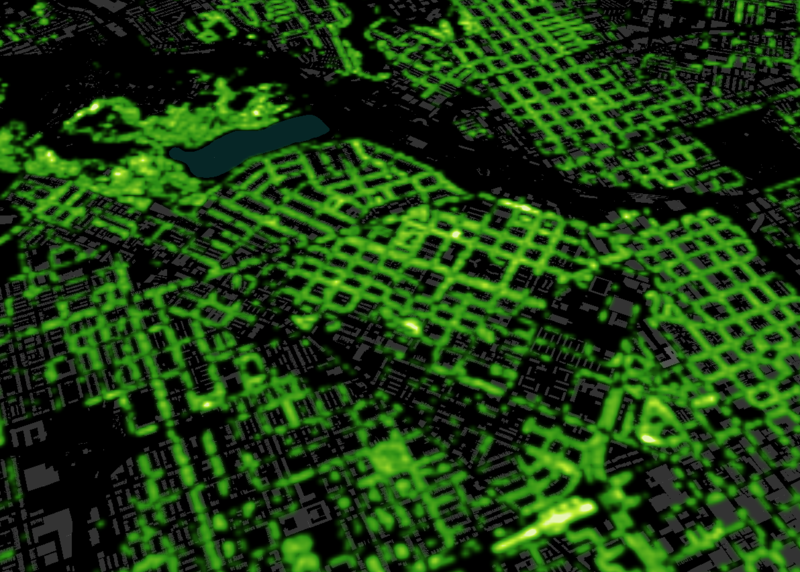 In the heatmap, we see some parts of the city stand out much more than others as far as tree density. Something to bear in mind is that this data doesn’t necessarily represent all trees in Baltimore, but does show those that the city, TreeBaltimore, Recreation & Parks and other organizations have inventoried and maintain in a database. 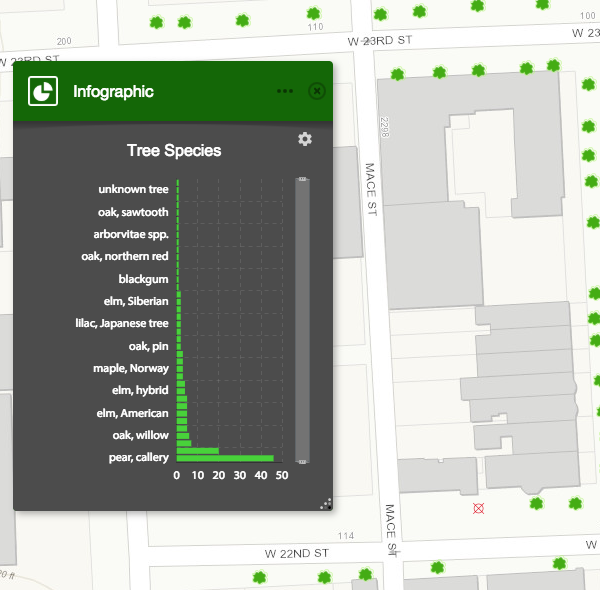 Visualizing the tree inventory data in this manner might show tree planting organizations which neighborhoods to put focus on for future planting efforts, or show where additional field collection might be needed to improve the dataset. My original intent for this map was to allow user filtering by species of tree. However, the data contains over 120,000 tree points and over 300 unique tree species, so to start I thought it best to just stick with mapping… trees. 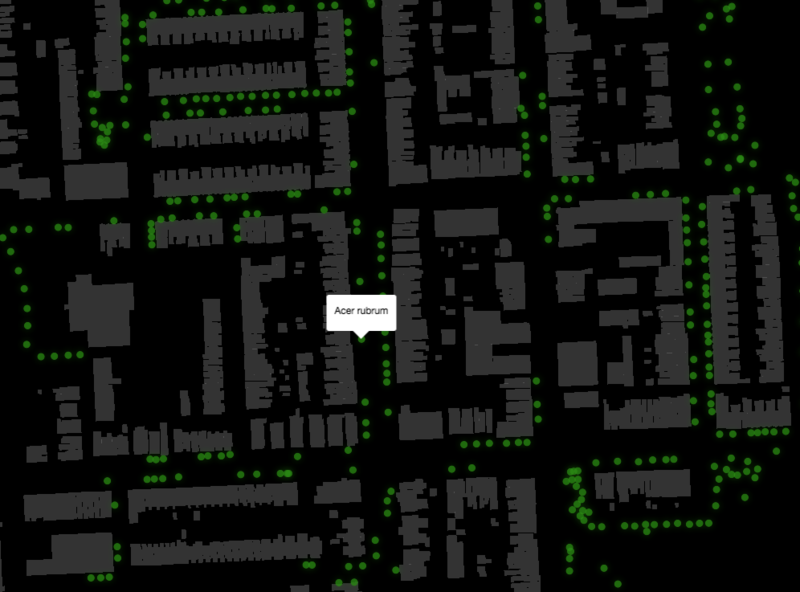 Another thought was to exclude tree data from the heatmap that fell within city parks, and to symbolize the parks on the map in a (green) symbology that would represent an obvious haven for trees. Doing this would put the map’s emphasis on urban trees, or those along the sidewalks of our neighborhoods. But, the park data in Baltimore’s open data portal hasn’t been accessible lately, so I gave up on that for now. Even since I pulled a snapshot of the dataset several weeks ago, I see that the tree feature layer has been updated – rendering my heatmap outdated! As a resident of Baltimore City, I am extremely pleased that this data is maintained, let alone that it exists. Now, when planting new trees in Baltimore, we can all look forward to the addition of points to this dataset and map. Data from TreeBaltimore and the City of Baltimore. Thank you to all organizations who contribute to the greening of Baltimore.